i don't know why but for some reason i thought you practiced hot yoga? all of these things are so lovely but i honestly save my worst, grossest, cheapest stuff for bikram because it all just gets so destroyed. but that mat! i wish! Aw, it's so sweet that you remembered! I did, a few winters ago, for a while, but I can't do it any more... I have a monthly gym membership that is way more affordable than a yoga pass so I'm hoping to supplement my gym routine with yoga at home. I've been subscribing to yogisanonymous.com for a while, and it's great. They have every kind of class imaginable and it's only $15/month. Oh neat, I'll check it out if they have previews and trials. Thanks! It really is! The nice thing is that it can become free hot yoga, ha ha. I've been practicing yoga and meditation 3-4 times a week since January, mostly just for de-stressing and relaxation. I find it really helpful for keeping myself present and releasing tension. 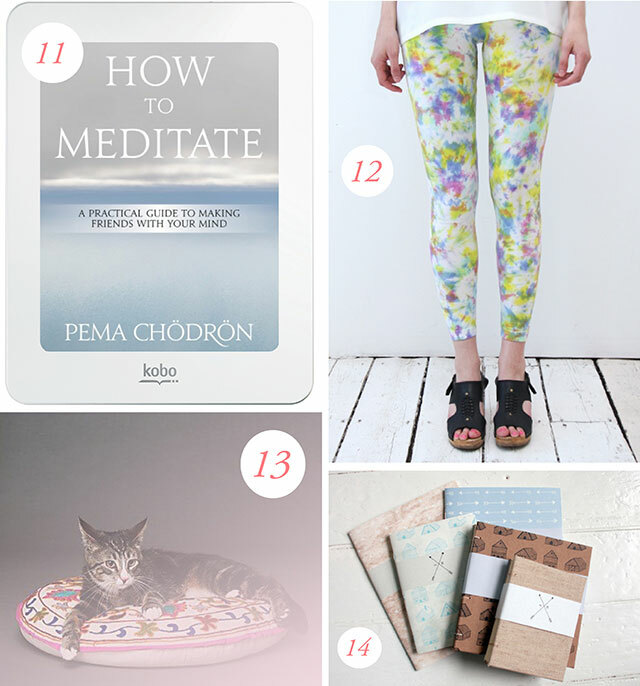 Might have to get that meditation book, too! Wow, that's great! I got the book from the library just to check it out. I think she's pretty well-respected,. I just cackled (caTckled?) at #13 because yes, yes. I'm the same with really being into yoga for a while and then not so much. But I'm feeling a yoga-period coming up because I really need it! Good luck with the 5-o'clock anxiety wake up call. Good luck to you as well! I always feel a burst of energy in the fall, so I hope that will be a good motivator. This comment is very kind and made me tear up a little. Thank you. I feel like this was something very nice and unexpected to read right now. Inspiring me to do yoga again (I'm also very on and off with it like you mentioned). Thank you! I'm really trying to get into yoga, but I can't find a good all-female class! 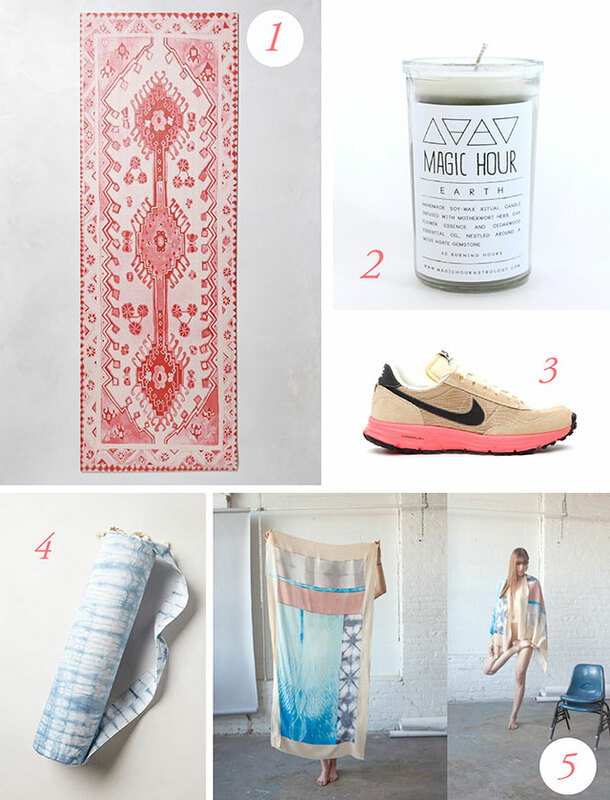 That red yoga mat is gorgeous. Funny, when I was going to classes most of the time they were all-female just by chance! How lovely! beautiful bra top - though I couldn't wear it either. A while back I won a month of free yoga (we were asked to share our best sob story for why we needed it) and the manager then asked me to clean their studio in exchange for free yoga -- such a godsend. I'm going to have to look into that Shiva Rea recording -- funnily enough, the studio is called Yoga Sanctuary! Yeah, lots of studios do energy exchanges like that. It's a nice concept! Actually when I first got the Yoga Sanctuary CDs the studio I was going to was also called Yoga Sanctuary, ha. I highly recommend yogadownload.com. They have TONS of classes that you can stream or download, and many of the shorter (20 min) classes are free. The longer classes are only a couple bucks. There are some guided meditations on there too. The cat pillow is great. My cat recently attacked me while I was on my mat, which did not = a relaxing yoga experience!!! Nice, thanks! There were a couple of suggestions for that site, so I'll check it out. Yeah, my cat decided to nibble on my hand yesterday... oh cats. Shiva Rea! Her prenatal yoga is my pregnancy dream come true. I'm pretty picky about my (video) instructors, and I love her. And every morning we spend together. Oh nice! I remember when I saw her prenatal yoga DVD with her pregnant belly on the cover, I felt so excited for her even though I obviously don't know her! I only knew her beautiful, soothing voice. love, love yoga. I could go on and on and your picks are just perfect! must try that candle. you should check out these leggings from James Preston on etsy. 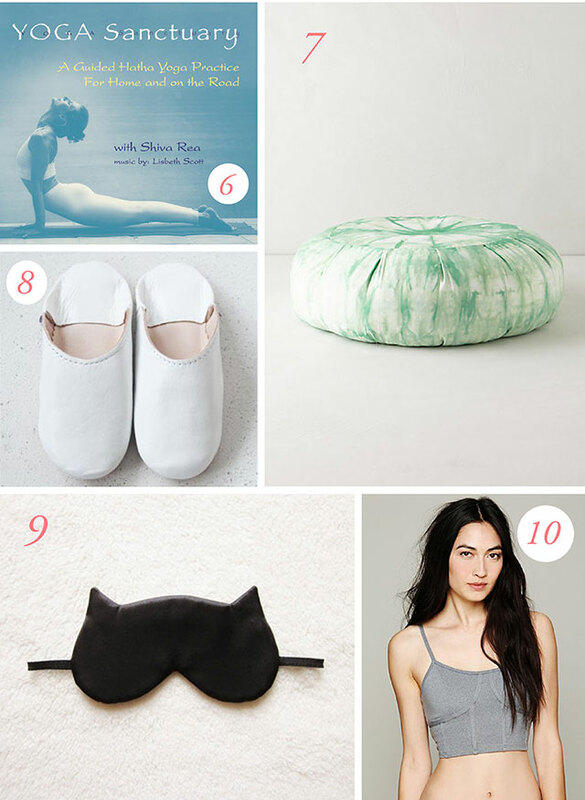 some are a little wild but I've got three pairs and they are perfect for a warm vinyasa practice. http://www.etsy.com/shop/JamesPrestonSF oh! and I've been making a killer yoga playlist on spotify - I'll share the link with you! i love to supplement classes at my studio in roncesvalles with online classes from yogadownload.com. you can stream free 20 minute classes or get a subscription which lets you download longer ones. i didn't think I would like home practice so much but these classes are really so good...so much variety! Yeah, I find that I can really get into it at home! It's nice to take the occasional class, of course, but at home with the right settings it can be great. I love yoga. I am lacking motivation to do it on my own and want to take classes once a week again instead. My cat loves the yoga mat, too. Good luck! Looks like many of us are in the same boat. I used to go to yoga classes twice a week, and loved it so much but haven't been for years. I'm hoping to get back into it now that I've just finished studying... This round up is gorgeous, and spurring me on even more. That mat is seriously beautiful, and I looove the Nike trainers! There are a lot of really rad yoga/meditation apps as well. A little too "new school" for some but I love the convenience! Oh, also, the Chodron book on meditation is phenomenal. I've been into yoga for about a year now, and I am seriously hooked. I love that I get a great workout, I can increase my flexibility, and practice meditation all at the same time. This tie dye yoga bag is perfect!